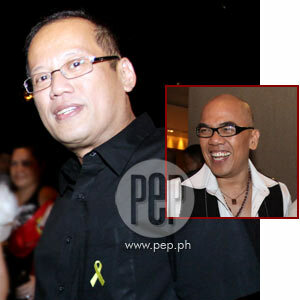 Sen. Noynoy Aquino believes celebrity TV host Boy Abunda (inset) can be an asset in his government. "He is an icon in the country and even more so for his ability to communicate, to understand the audience and to be able to advance a particular set of ideas," said the politician. Presumptive president-elect Sen. Benigno "Noynoy" Aquino III is considering Boy Abunda for a post in his administration, reported GMA News.tv today, May 31. In an interview at his Times Street home, Sen. Aquino told the press that Abunda is suited for his administration because of his "strong marketing and communication skills." "Think about it from a marketing perspective, things that you would want to market the Philippines for. He will be a good communicator," Aquino said of Abunda, known to be a close friend of the Senator's sister, Kris Aquino. Both Boy Abunda and Kris Aquino host two entertainment programs In ABS-CBN—the primetime showbiz news program SNN, and the Sunday showbiz talk show The Buzz. Abunda, known as the "King of Talk," was also the Aquino family's spokesman when former President Cory Aquino died in August last year. Aquino did not say what department he feels Abunda would be most suited. He did not deny or confirm reports that Abunda may possibly be assigned to the Department of Tourism, in a secretary-level position. "It's possible or lower. Usec [Undersecretary], Asec [Assistant Secretary] also," Aquino told the press. Abunda finished college at the Ateneo de Manila University. He also took up further studies in international relations. "He is an icon in the country and even more so for his ability to communicate, to understand the audience and to be able to advance a particular set of ideas," Aquino said. When asked if he already talked to Abunda about the matter, Sen. Aquino exclaimed, "Parang may nabanggit na 'atang, 'mukhang ok ka sa ganito.' On that level." Sen. Aquino further said, "Problema no'n, how much does Boy Abunda earn in a week? How much will his salary be in a year in government? Tapos pag Cabinet position, divest." "The only reason why I don't wanna answer that question ay dahil malapit 'yan sa totoong buhay," the TV host said. "Pero huwag muna...hindi ko alam. You know, kung tinanong mo ako diyan dati, I will have exactly said no. Pero ngayon, hindi ko alam, hindi ko alam talaga... Pinag-iisipan...nakakakaba!" Abunda added, "Pag nandito ka na pala sa pagkakataon na ganito, parang... 'But no, I can't do that. I'm not qualified to do it.' But there are some jobs that I may be able to do. It has not happened yet. But ewan ko, meron akong pakiramdam na papunta doon."